Domestic painting and decorating is where Chris Arlett Painting Contractors comes into its own. With our dedication to quality and our attention to detail, we attract many domestic projects. Hanging wallpaper is a popular method of decorating; our professional paper hangers are all fully qualified so you can trust us to deliver a finish that you can be proud of. We take the time to prepare the surfaces to be decorated so the final finish is of the highest quality. We take care to specify the best paints and materials for the surfaces to be decorated so you can be sure of an exceptional job. We provide exceptional quality, no delays and competitive prices, as well as caring for your home whilst we work. Interior and Exterior painting and decorating. Preparation of surfaces, to ensure the perfect finish. All flooring carefully sheeted up to protect from spillages. Hanging of lining papers and expensive wall coverings. No payment until you are 100% happy with our work. and employers liability insurance offering peace of mind for the home owner. Chris Arlett were asked to paint the exterior of this beautiful house in the Langstone area of Newport. The home owners, Steve and Jane May, had recently installed new PVC windows and doors throughout the house and wanted the garage doors to match that. Chris Arlett searched for the perfect shade of colour and ensured that the owners request was delivered upon. This beautiful house in the Langstone area of Newport required an exterior paint for the summer months. Home owner, Martin Saunders, require a professional finish to the house with extra care to ensure that the large conservatory remained paint free. This beautiful semi-detached house in Newport required the walls, guttering and other exterior items to be painted and protected from the elements. Chris Arlett’s expert team of painters treated and painted the exterior walls to with stand the weather, as well as refreshing the exterior trimmings of the house to ensure it looked bright and fresh. This back room of a local church was in need of work and Chris Arlett were able to transform the former stone room into a bright space for church activity. The ceiling, walls and doors of this large room were all in need of work as the church looked to transform the space into something more useful. Tremorfa Church now have a clean space for any church or community activity. The living room of this family home in Newport has been painted and decorated by Chris Arlett. 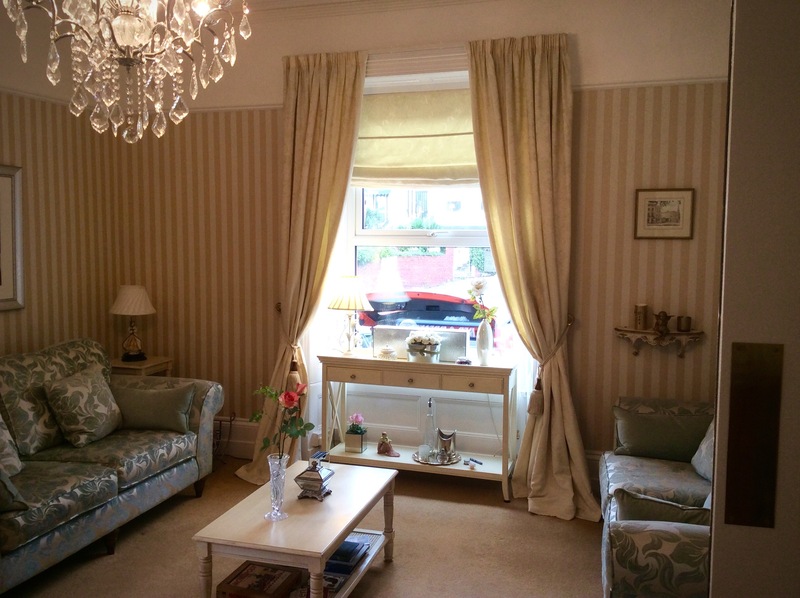 Chris Arlett were asked to mach the colour scheme of the room to the desired curtain pattern of the family. With a little research we were able to find a paint colour scheme and flowered wall paper that matched and brought the room to life. This long established family run Bed & Breakfast in Newport required their communal living room to be decorated and to provide guests with a warm, cosy and welcoming feel. The guest communal room was wallpapered and painted to provide a cosy and homely feel for visitors from around the world.